As a proud graduate of the University at Buffalo, I am positively delighted to see a study from UB’s Communication Department (one of the programs I graduated from) topping Techmeme. Techmeme is a tech news aggregator that collects the day’s top technology stories in a single place. Typically the stories are from the major tech sites (Engadget, TechCrunch), the blogs of major tech companies, or the 800lbs gorillas of the mainstream media, but today UB stands among them. The research in question has been conducted by Michael A. Stefanone, PhD and centers on social media behavior. He explains his work in this short video. The results of the study are not shocking, and the implications are sad. As a geek I am deeply troubled when I see people constructing their identity around their looks as opposed to skills or their humanity. One consistent problem with academic research has been that it isn’t well-publicized, and on the rare occasion that it is, journalists usually flub the reporting. I’m happy to see that Buffalo has been publicizing their professor’s work, and using YouTube to properly articulate the research and its meaning. Seeing a study from my old department on Techmeme is the geek equivalent of winning a major sporting event. I’m so proud right now. 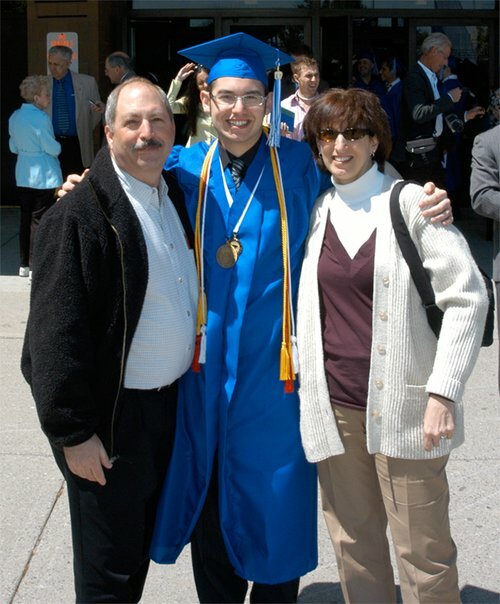 Undergrad graduation with the folks. Good memories. It’s quite impressive what they’re doing up there in Buffalo. Great post. And you can’t argue with the wings.